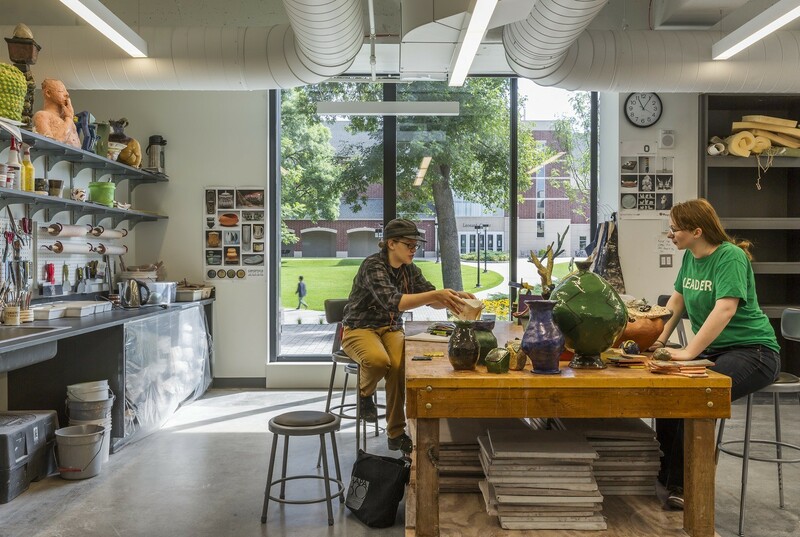 The Janet Wallace Fine Arts Center anchors the western edge of the Macalester College campus in St. Paul, Minnesota. 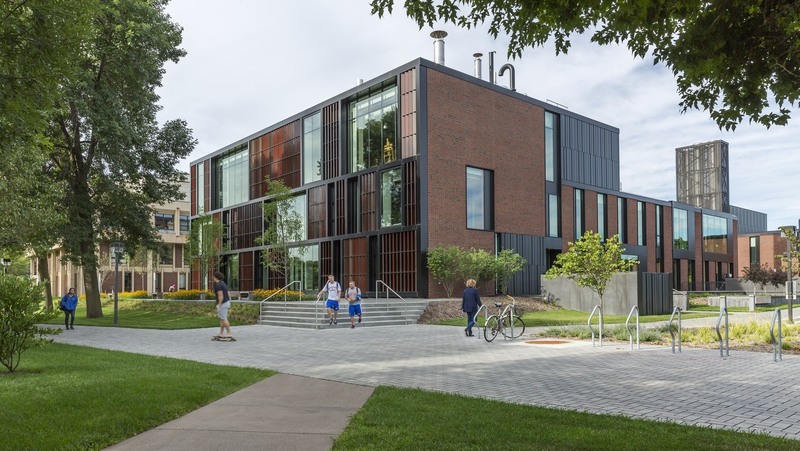 Built in the 1960s, the structure was in critical need of an update when college officials sought to redesign the complex, breaking down the silos between studio art, theater, and music while upgrading and customizing the spaces needed for each discipline. Because of the tight urban location of the campus, new campus construction must maximize multi-use possibilities to make every space count. HGA responded with a design for a state-of-the-art visual and performing arts complex anchored by a light-filled, two-story arts commons. 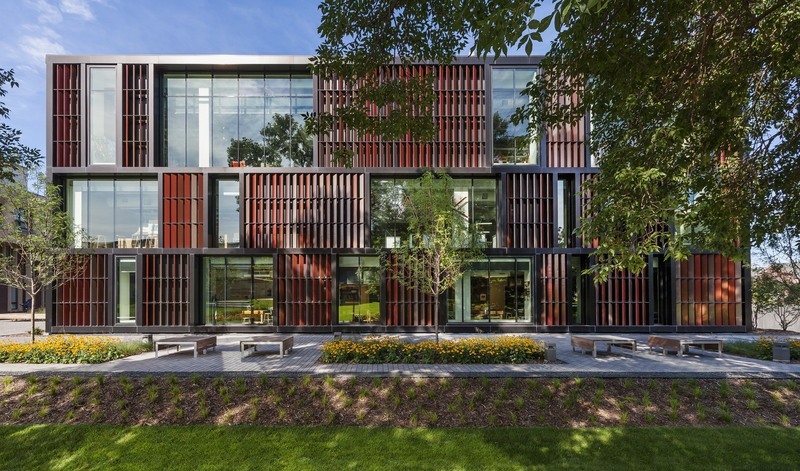 The exterior of the newly renovated center establishes an identity for the arts on campus: the facade of the music building features a staccato texture of angled panels that reference the rhythm of musical instruments, while the east side of the studio art building features terra cotta louvers that pay homage to clay objects and glazing processes. Exterior and interior lighting highlight the architectural detailing and activity within. 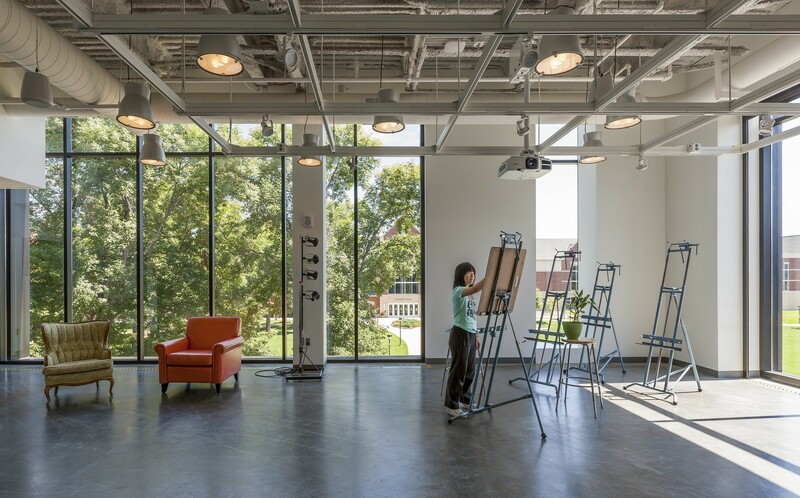 Throughout the renovated project, large windows connect the activity of the programs within to the bustling campus outside, inviting all to partake in the process of making art. Two phases of the three-part project are complete. Studio spaces for activities that create exhaust were carefully zoned in the building to minimize duct work runs and avoid reentry of chemicals and particles into the building’s fresh air intake system. All new mechanical systems and controls focused on maintaining safety while operating sustainably. The renovation of this dark 1960s building into something that's more open and transparent is really beautiful. I like the way the red terracotta plays off the brick and becomes something that's really modern.